How do you build a photography site that expresses your vision? I interview Chris Lang, who has become as well known for his beautiful web site designs as he has for his excellent photography. Chris uses SiteGrinder 2 to construct these stunning online properties, and in this interview, he shares his philosophies and a few of his secrets. 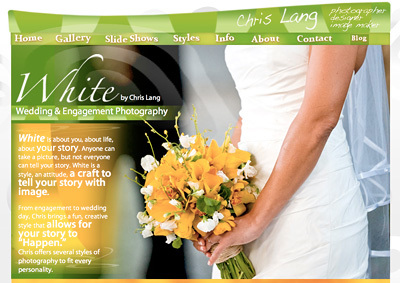 Editor's Note: Wedding graphic is a screenshot of Chris Lang Weddings created by Chris using Photoshop and SiteGrinder 2 (which is a sponsor of The Digital Story). Chris Lang is a professional photographer, designer and image maker based out of Wilmington NC. Among his various projects, Chris is a marketing photographer for the PGA's Travelers Championship in Connecticut. Vibrancy is the April 2009 Photo Assignment. Here in North America, Spring is on the way. But nature isn't the only source of vibrant colors. See what you can create for this assignment. You can read more about how to submit on our Submissions page. Deadline for entry is April 30, 2009. It can trim your offline marketing tolls too if you get it finished decent. Checking somebody who not only does SEO but does the content initiation and distribution for you as well as keyword search, updating content on your web site and blog, having professionaly composed press releases at small costs as referred previous is what suits many small business proprietors and yet there are many another who seek to do it themselves, they get stuck as they dont have the knowledge or the technical skills to do it promptly and they give up. Thank you for this article! I've just retrieved a really marvelous news site about best marketing Taste it! We just couldnt leave your website before saying that we really enjoyed the quality information you offer to your visitors... Will be back often to check up on new stuff you post! I just couldnt leave your website before saying that I really enjoyed the quality information you offer to your visitors... Will be back often to check up on new stuff you post! It appears that you have placed a lot of effort into your article and I require more of these on the net these days. I sincerely got a kick out of your post. I don't really have much to say in response, I only wanted to comment to reply wonderful work. A thoughtful insight and ideas I will use on my blog. You've obviously spent some time on this. Well done!